AUSTIN, Texas — As he gears up for a possible second presidential run, Texas Gov. Rick Perry is crisscrossing the country extolling a business-first philosophy he says made his state’s economy white-hot — and can work for the rest of America too. But back home, members of Perry’s own party seem poised to dismantle key parts of his legacy. The longest-serving governor in state history isn’t seeking re-election and may see two of his achievements — distributing hundreds of millions of dollars to attract top employers to Texas and stockpiling a rainy day fund robust enough to bankroll infrastructure projects — swept away not long after he moves out of the governor’s mansion. 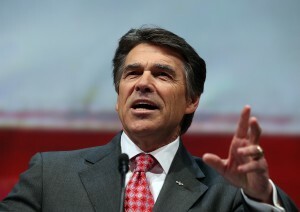 Also likely doomed is a Perry-backed program extending in-state university tuition to the children of immigrants in the country illegally, a nod to Texas’ Hispanic population that’s long been championed by top business leaders clamoring for a softer approach to immigration. The rebuff to Perry, who was once known as one of America’s most conservative stalwarts, reflects the grassroots surge that has seen the tea party seize almost total control of the state’s political and social agenda in the last two years and push it to his right. “The young conservatives have completely moved on, but I think even some of the old guard are pretty tired of him,” said Don Zimmerman, an Austin-area tea party activist who was a delegate to the national GOP convention in 2012. The shift raises the awkward possibility that Perry — looking to bounce back from his short-lived, gaffe-marred 2012 White House campaign — could wind up running nationally on his record even as it’s being undone. Already, the snubs are evident in what was supposed to be his victory-lap year. The governor’s name barely came up during the recent Texas Republican primary campaign, which produced a near clean-sweep for top tea party-backed candidates. And the response at the state GOP convention Thursday may be muted when Perry addresses a gathering he once dominated. Perry’s departure could spell the official demise of a longstanding brand of Texas conservatism that avoided fiery immigration rhetoric and deferred to big-business even at the expense of some free market ideals and pledges to shrink government. That approach long buoyed Perry and his Texas gubernatorial predecessor, George W. Bush. Texas created a third of all net new jobs nationwide between 2003 and last year — and Perry’s pushing of low-tax, relaxed-regulation policies remains wildly popular among conservatives. But his support for using public seed money and incentives to boost the state economy aren’t as beloved. Tea-party champion Ted Cruz, who defeated Perry’s preferred candidate, David Dewhurst, for a U.S. Senate seat in 2012, suggested during a recent Austin visit that only the free market — not Republicans pulling economic strings — can create jobs. The GOP nominee for lieutenant governor, Dan Patrick, and Abbott both say they’d like to wipe out the in-state tuition law Perry signed in 2001. The governor passionately defended the policy during his 2012 presidential run. Meanwhile, Patrick, who will oversee legislation in the Texas Senate if he’s elected — which is likely — has said he wants to refund the about $8 billion left in the state’s rainy day fund to taxpayers rather than keep it on the government books. Mark Miner, a veteran of Perry’s 2012 presidential campaign who’s helping him again raise his national profile, shrugged off the idea that the changed political climate would affect Perry should he run for president. “Texas continues to be the economic engine that’s driving this country and that’s the result of the work that Governor Perry has done,” Miner said. “There’s a lot of angst about those who have been there for a long time,” she said.